October 14, 2008 By Robert Blicharski & filed under All Articles, Other Tactics & Training, Tactics/Training. Firing through windshield from driver seat, student uses steering wheel to steady his shot. There seems to be a lot of information out there about gunfighting in general, but not much about gunfighting around cars. The need to know about what happens when bullets start flying in cars is obvious, but there are very few sources of valid information. You don’t have to think very hard to remember the last news story of someone who was assaulted while he or she was getting into their car, putting their groceries in the trunk or just sitting in their car at an intersection. Opinions about what happens to bullets around cars may not be based on study and experience, even if you ask someone with the title “Firearms Instructor.” Not many people have the opportunity to look at empirical data after actual gunfights, to examine what really happens when lead starts flying through cars, or to perform ballistic tests on vehicles. Few have the opportunity to speak with dozens of individuals who have been in gunfights around vehicles. Fewer still have applied such knowledge and implemented training programs that address this difficult subject. 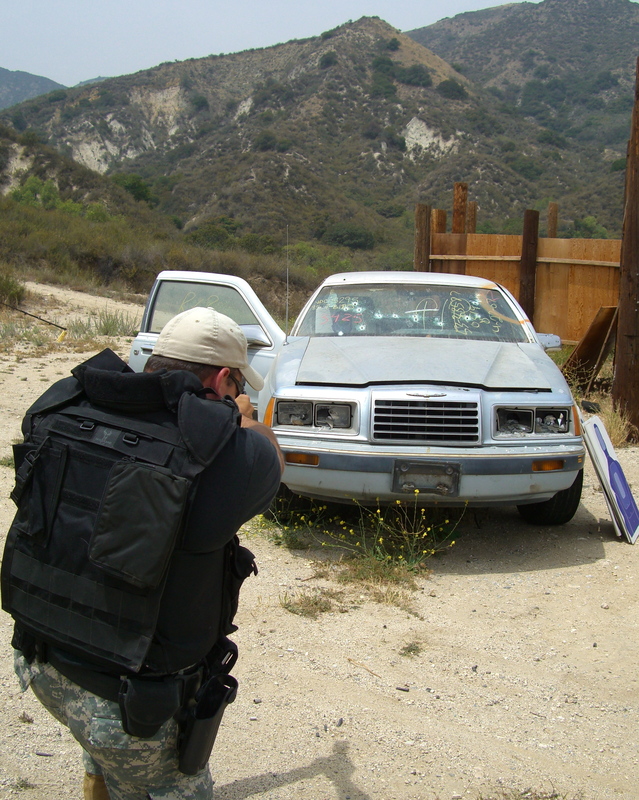 However, there are a few training organizations that offer Vehicle Assault training. 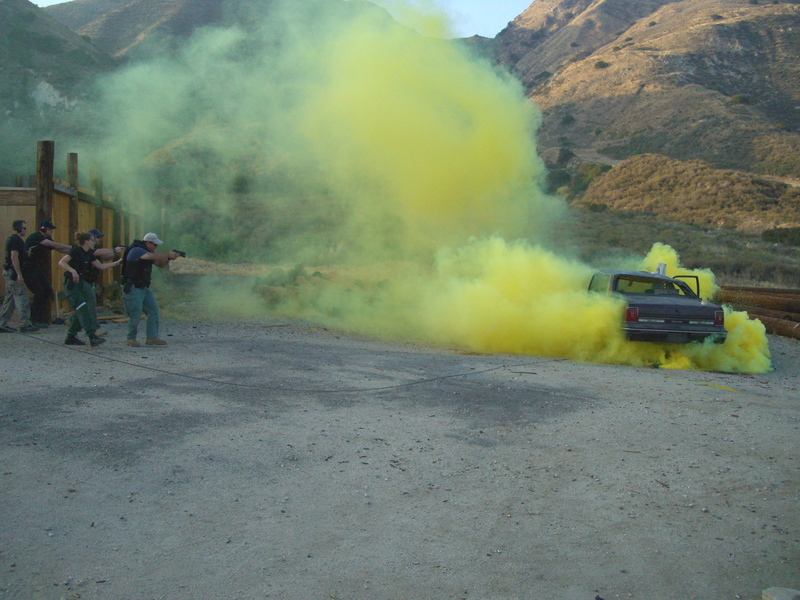 Training scenario based on actual gunfight from early 1980s. Several targets inside and around vehicle must be engaged by three students as they approach vehicle and smoke begins to clear. Each shooter is accompanied by a spotter in order to keep training evolution as safe as possible, but they offer no help to students. One place where you can get hands-on experience on a more restricted budget is at International Tactical Training Seminars (ITTS), based in Los Angeles, California. Head Instructor Scott Reitz is a former LAPD SWAT team member who has been conducting vehicle assault classes since the mid-1980s. His familiarity with the subject is based on 30 years of seeing what works first-hand. 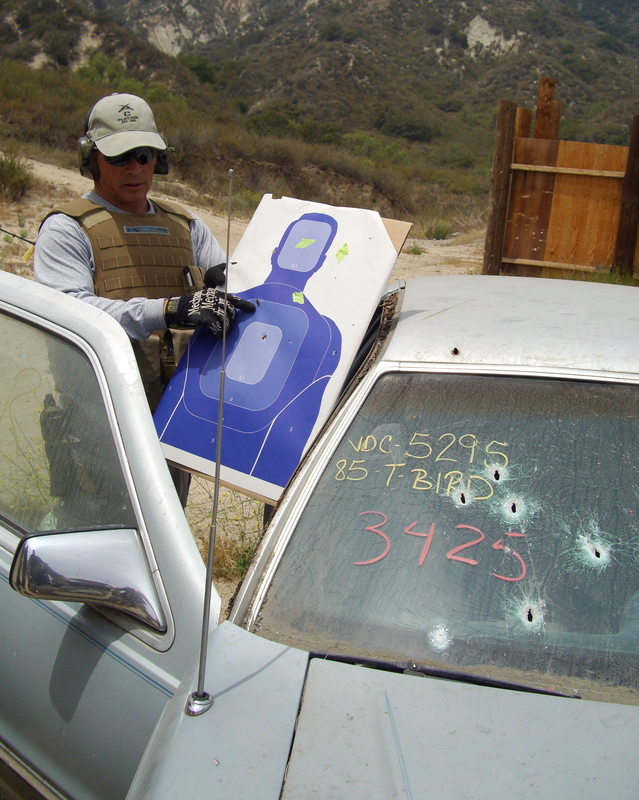 Over those years Reitz and his fellow instructors at ITTS have shot into, out of, and through hundreds of vehicles during their two-day Vehicle Assault classes. In every two-day class, students have the opportunity to see for themselves the ballistic performance of their own weapons, hear lectures about actual officer involved shootings, speak to individuals who had been involved in those shootings and get a debrief on the findings from the personnel who investigated the incident. Scott Reitz examines and explains bullet hole penetration after it was deflected as it passed through front windshield. Student was aiming at small piece of green tape in center of target’s head. One of the first things Reitz and his fellow instructors address in the course is the performance of bullets through the two primary mediums in vehicles: metal and glass. To understand what happens to a bullet as it travels through glass, the instructors explain the different types of glass in a vehicle. Factors such as different layers of laminate, thickness, the angle at which the glass is mounted and glass/vehicle age all have a lot to do with how the round you fire will behave once it encounters and penetrates the medium. Once the range evolutions begin, many students find it surprising how drastically different side window glass behaves compared to front windshield glass. 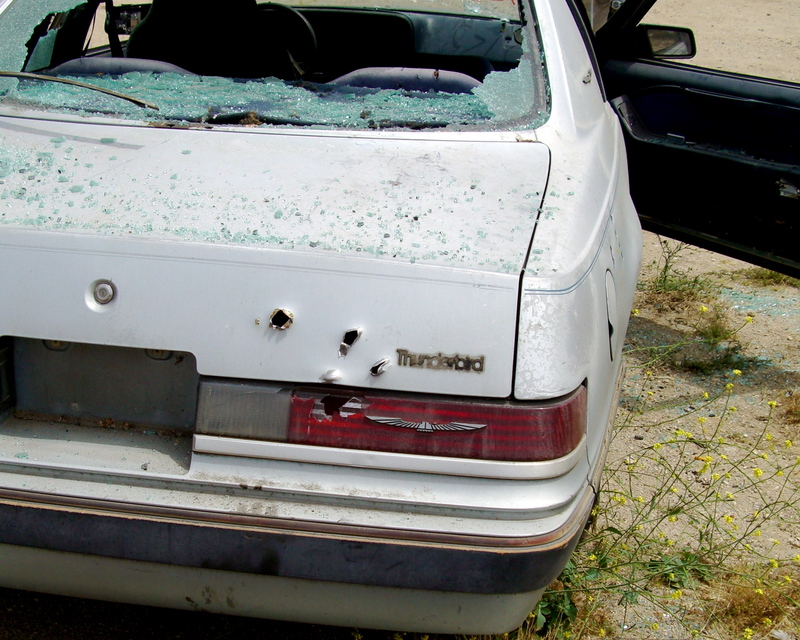 When firing through the front windshield, students discover that the bullet forms a distinct hole, with a jagged, circular white halo. What makes windshields different from the other windows is that they are very resilient and are designed to stay intact even after dozens of rounds have been fired through them. Side windows behave differently. Unlike the windshield, the glass in side windows is made to shatter into small, non-jagged pieces upon impact. This is why the guy who steals your car stereo smashes the side window and not the windshield. The above scenarios take on a whole new look (literally) when observed at night. When glass is penetrated at night, the above outcomes present a much greater visual challenge than they do in daylight. Glass perforation has a huge influence on visibility into a vehicle. Even if you are standing just two feet away from the window you just shot through, there is a good chance you may not be able to see anything through it. Of 15 shots, only two made it completely through, and one almost made it only to be stopped by body molding. 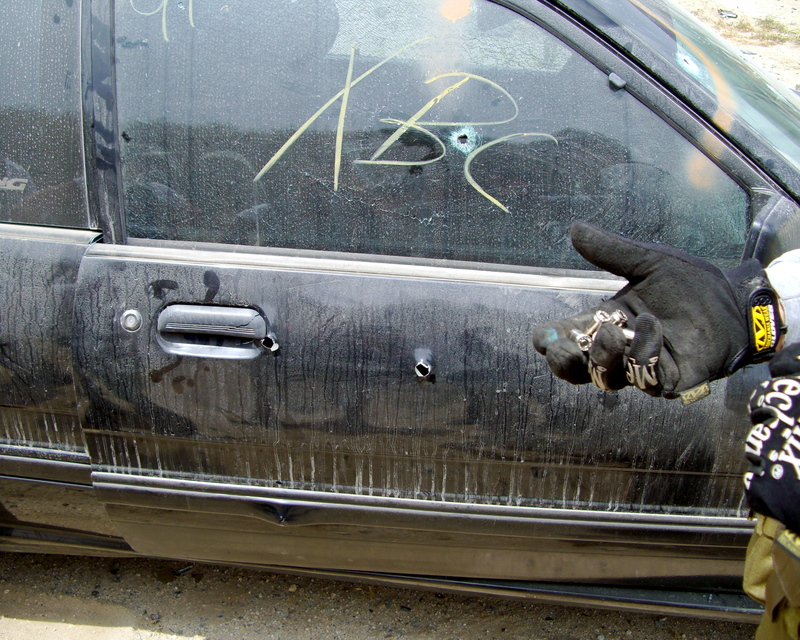 Other rounds were stopped and/or deflected by various mediums inside vehicle and two doors. As students in the class find out, vehicle body panels present a whole different dynamic. Reitz, who routinely testifies in court on uses of force involving firearms, cites actual examples of officers who engaged in gun battles and used particular portions of the vehicle body during the gunfight to their advantage. 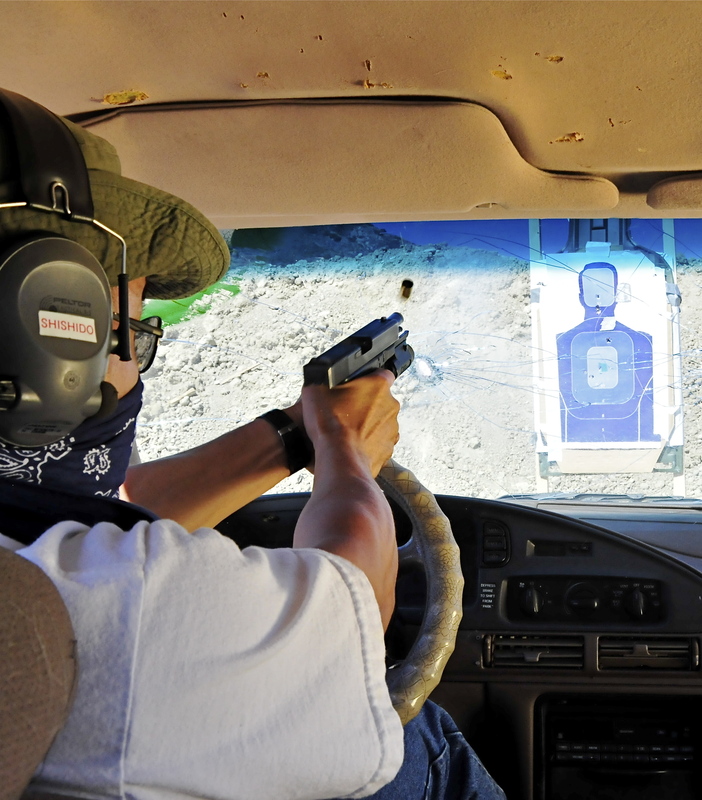 The instructors cite incidents where an officer or suspect may have done something in a car that altered the outcome of the gunfight and thereby gave rise to a particular training evolution. Student approaching vehicle straight on and engaging suspect located in front passenger seat. Suspect is barely visible through previously perforated glass. The class is not just about shooting up cars. 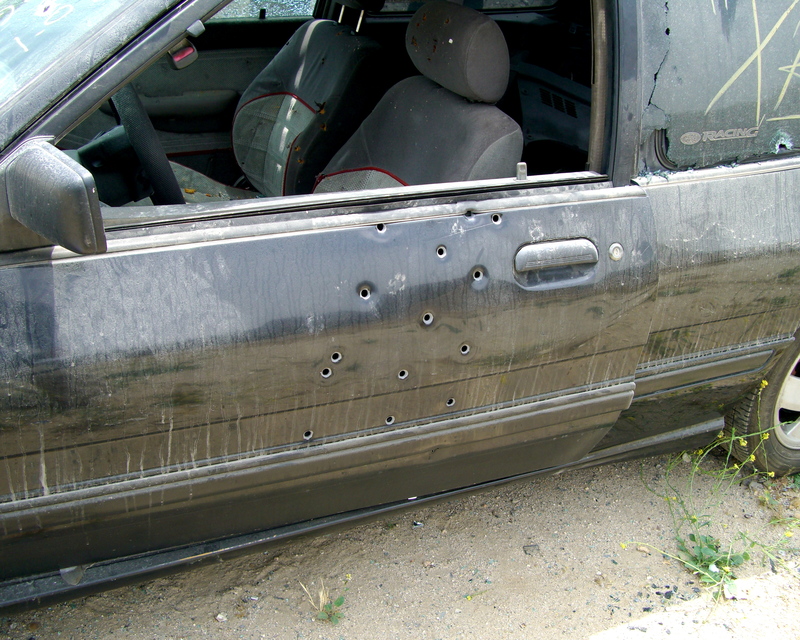 During the first day, a careful examination of the effects of rounds fired into the cars follows every shooting evolution. The instructors are well versed on the “how” and ”why” of what is happening. During the two days of shooting at two different vehicles, students get to see for themselves how panels, welds, interior materials and various structural reinforcements inside the vehicle can stop a bullet or drastically change its angle of flight. Though trunk may seem like solid cover to hide behind, this test proves it is not. Four out of five .45 caliber duty ammunition rounds passed completely through, and one was stopped by the fold of the metal. The culmination and most exciting portion of the class is when students apply what they had learned in the two days as they work in teams of three to five and solve problems involving multiple moving targets, hostages, obscured visibility and simulated injuries to the officers/rescuers. And all this is done at night! Reitz’s favorite saying, “This is not play-shooting, it’s gunfighting,” takes on a profound new meaning. During the scenarios, students drive a police vehicle up to the suspect car, which is staged with an unknown number of bad guys, and must solve the problem without any help from the instructors. This is problem-solving under pressure, requiring participants to employ all of their skills: shooting one-handed and from unusual positions, shooting and reloading on the move, teamwork, communication and application of various illumination techniques. There are few places where this type of training can be done safely, legally and under the tutelage of seasoned instructors with verifiable credentials. The ITTS Vehicle Assault class offers an environment where the savvy student does not waste time listening to hyperbole or squander ammunition on make-believe simulations. “In today’s environment, there are a lot of choices among schools. Like with anything else, you have to do your research before spending your hard-earned cash on tuition, ammunition, travel and accommodations,” says Mann. ITTS is one school where students get to learn, challenge and apply theory for themselves. This is as hands-on as it gets, and it’s an eye-opening experience even for seasoned operators.